A new photo, taken from the International Space Station, has just been released by NASA showing the devastation caused by the major earthquake which hit Haiti a few weeks ago. 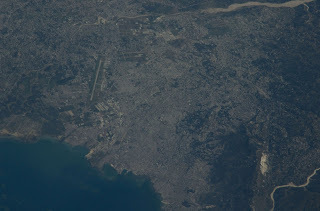 An Expedition 22 crew member onboard the ISS took this image of the 260-year-old city Port-au-Prince on Jan. 18, 2010 when they could view the area. This was a few days after the major Haitian earthquake occurred and brought devastation to Port-au-Prince, Carrefour, and the surrounding region. The Toussaint Louverture International Airport, clearly visible on the north side of Port-au-Prince, is the central focal point of incoming international aid. Click on the image for a larger resolution.